Master the techniques and problem-solving skills needed to manage spinal and TMJ disorders! 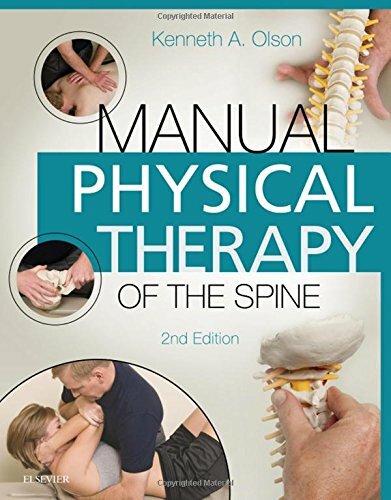 Manual Physical Therapy of the Spine, 2nd Edition provides guidelines to manipulation, manual physical therapy examination, and treatment procedures of the spine and temporomandibular joint. Informed by evidence-based research, this text offers detailed instructions for reaching an accurate diagnosis and developing a plan of care. And to support the descriptions and photos in the book, over 200 videos on a companion website demonstrate spinal examination and manipulation procedures. Written by well-known spinal manipulation expert Kenneth Olson, this resource provides the complete information you need to make sound decisions during clinical interventions. Descriptions of manual therapy techniques include evidence-based coverage of the examination and treatment of spine and TMJ disorders, along with discussions of alternative treatment methods and potential adverse effects and contraindications to manipulation. Guidelines for completing a comprehensive spinal examination include medical screening, the patient interview, disability assessment, and tests and measures, along with an evaluation of the examination findings and the principles involved in arriving at a diagnosis and plan of care. Impairment-based manual physical therapy approach includes a review of the evidence to support its use to evaluate and treat spinal and TMJ conditions. Case studies demonstrate the clinical reasoning used in manual physical therapy. Guide to Physical Therapist Practice terminology is incorporated throughout the book, using accepted terms familiar in physical therapy settings. Expert author Ken Olson is a highly respected authority on the subject of spinal manipulation in physical therapy. Video icons in the book indicate the procedures demonstrated with online videos. A clear, consistent format for explaining techniques makes this reference easy to use in the clinical setting. Spiral binding allows the text to lay open for ease of use while on the job. NEW! Coverage of emerging topics includes soft tissue assessment, mobilization, dry needling, myofascial pain and trigger points, thoracic outlet syndrome, cervicogenic dizziness, and differentiation of headache types, plus expanded coverage of examination procedures and psychologically informed management strategies for chronic low back pain. 120 NEW video clips are added to the companion website ― over 200 videos in total provide unique 3-dimensional views of exam and manipulation techniques, showing each procedure step by step from frontal, lateral, and cranial perspectives. NEW! Full-color design and photographs show essential concepts and procedures from multiple angles, illustrating hand and body placement and direction of force. UPDATED evidence-based research provides the latest thinking on manual therapy of the spine.